I made a c2c afghan for a baby that had 4 woodsy animals on it. 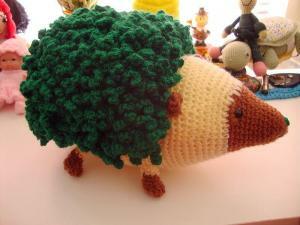 I made a hedgehog to go with it and here is Harold. he was different, and his hair took me about 3 days to make. I got him as a free pattern from Red Heart UK. That looks like a lot of work went in to it. Lucky baby. Beautiful work, Mary Jo! The afghan is wonderful and Harold is so cute. He is so cute. It was worth your time on the hair. Welcome to the world, Harold! Your adorably, cuddly back is going to have lots of love by tiny fingers. It was worth the time, Mary Jo! He's perfect. VERY cute! . You did great work. How long is your Herold? Thank you all. They are both put away till they leave for NJ. Harold is about 11 1/5 inches long and about 5 1/2 inches high with the hair and he is really, really, soft. Adorable. What a wonderful set. Love them both, I have the pattern book with that afghan and really want to make one, yours turned out so cute! Thank you all. I sent the pictures to my sil who I will be sending this to for the auction. She loves Harold. That's really adorable, how is the hair made? There is a swatch made with every other row sc in back loop. When this is done, then you start with the first stitch, ch 7 ss in 2nd chain from hook and 2 sc in each stitch after to the end. ss in next stitch and start over again. Like it said it took me 3 days to make the hair. I won't be doing it again real soon. Thank you so much, I can't wait to try it out.